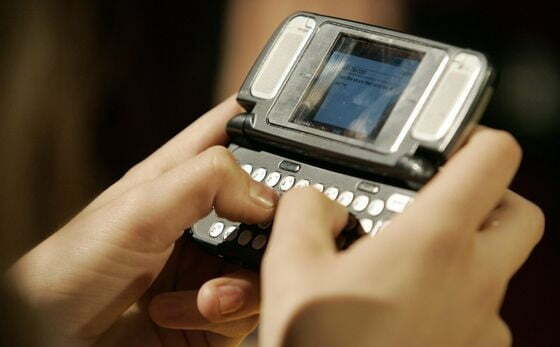 Texting is on the rise in a major way. The average U.S. teenager sends an average of 3,339 texts per month, or six texts every hour he or she is awake, according to an extensive study by The Nielsen Company. Kids ages 13 to 17 send roughly twice as many texts as any other age group, outpacing 18 to 24 year-olds, who send about 1,630 texts in any given month. The study tracked data usage from the monthly cell phone bills of more than 60,000 mobile subscribers from April to June 2010 and combined this data with survey answers from more than 3,000 teenagers. Interestingly, though teenagers send the most texts, they don’t talk on the phone much. Voice calls among teens were down 14 percent. Teenagers use fewer minutes than any age group except adults 55 and older. 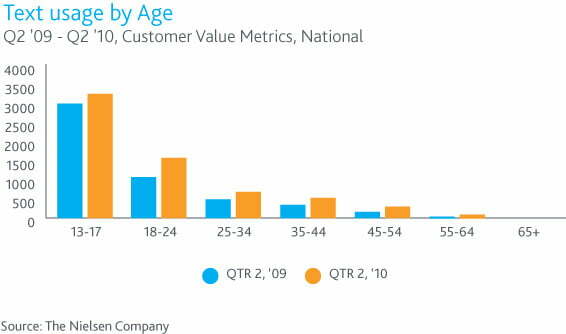 Adults in their 20s and early 30s tend to use the most minutes. Since 2008, the main reason teens buy a cellphone has changed. 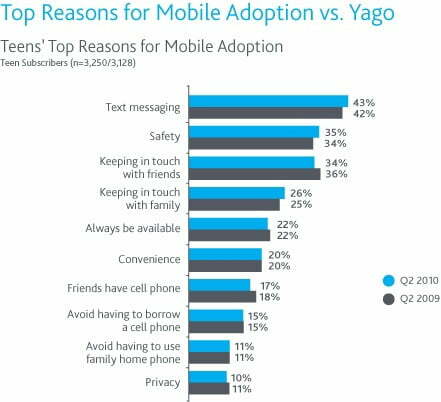 While safety used to top the list, text messaging is now the main reason 43 percent of teens buy a phone. Keeping in touch with friends ranks third at 34 percent, followed by family at 26 percent. Other top reasons for owning a phone include convenience, to ensure they’re “always available,” peer pressure, and to avoid having to use the family’s home phone. No teen wants to be caught using a landline; how embarrassing. Data usage among teens is up about dramatically across the board with 94 percent of teens identifying themselves as “advanced users.” Sixty-two percent of teens use picture messaging (MMS), followed by the Internet at 49 percent, app downloads at 38 percent, e-mail at 38 percent, and text alerts at 38 percent. Finally, in almost all age groups there is a gender gap when it comes to how teens use their phones. Females, especially teenagers, exchanged significantly more texts and used more minutes communicating. For example, teen females received an average of 4,050 texts per month, while males the same age received only 2,539. Voice usage is much the same, with females talking an average of 753 minutes per month, while males talked for 525 minutes. However, data usage is a different story. Teenage males used an average of 75MB of data, higher than females who logged an average of 53MB. It appears that men use their phones more as gadgets, while women use them to communicate more. Now if we could get teens and adults to stop browsing and texting while driving, this study would be less concerning. Unfortunately, it’s also on the rise.